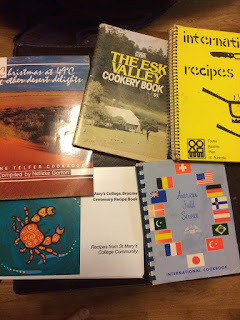 I collect cookbooks produced by communities. 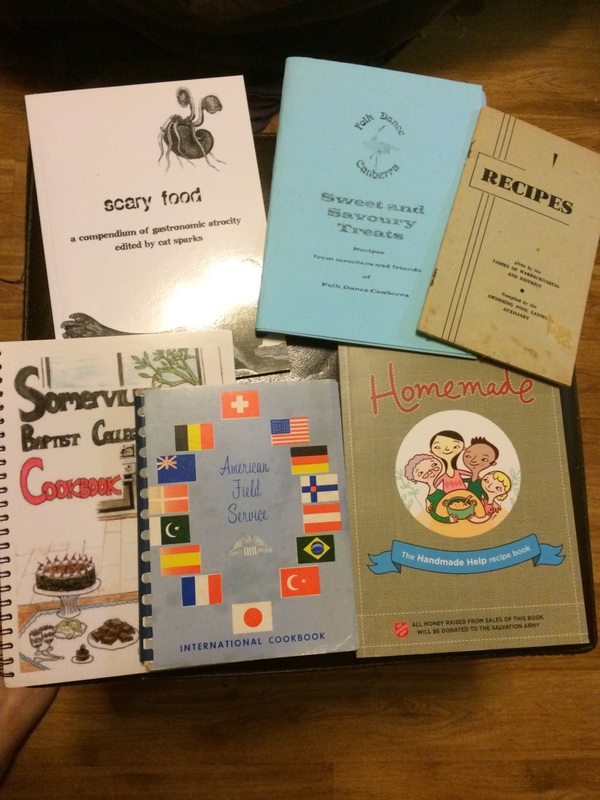 Sometimes they’re big volumes, stuffed with recipes from every single family that attends a primary school, sometimes the recipes are full of healthy ingredients to reflect the interests of a life-saving organisation. One book is full of recipes from tins and packets. A whole group of books are simply copied from a stock source, with the names of the organisations changed. 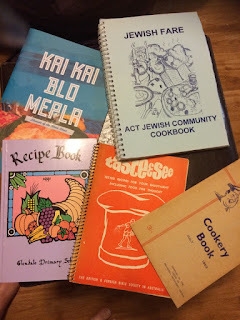 Last year a hundred of my community cookbooks were stolen and this week a friend posted a few replacements as a gift. This is why I’m writing about them today. The changes in my collection and the emotions behind them – the sorrow of losing so much and the joy of friends remembering me and sending me more – brings the history of cookbooks into the forefront of my mind. This post is dedicated to those kind friends who are watching out for community cookbooks for me because of last year’s loss. I want to talk about why it matters to me so very much. As well as what I talk about here, I use my collection to build foodways for characters in my fiction, but that’s a different story. It’s just as important: fiction rings out to the reader more clearly when the food is the right food for the place and time and when a character has their own interpretation of it. If the interpretation is sound then a simple cooking scene will resonate with every single reader who has a share in such a foodway. A different story, but a fascinating one. This type of volume is a by-product of printing. It never has been a major part of the industry, but it’s been around for a while. The reason for a community to order a cookbook are varied. Some are to raise funds and some are to commemorate a big event and some are ‘because we felt like it.’ My own recipes are in several of the volumes that survived the theft. One of the volumes (Homemade, 2009) raised money for bushfire victims, and another (Scary Food) is part of a horror anthology edited by Cat Sparks. The first is all recipes, dense and rich. Half the copies printed were given to those who lost everything in the 2009 bushfires, which means some of us who contributed gave important family recipes, in the hopes that we might replicate recipes that had been lost in the fire. Scary Food is mostly short stories, with just a sprinkling of dark recipes. This kind of book, like the seventeenth century chapbook, a form of cultural ephemera. While a few volumes may be treasured for years or may enter collections, most fade. Some of the volumes are foodie treasures and some of them echo the worst food of a time and place, or the idea (when the book is pre-packaged and just the name of the organisation is changed) that there is a shared cuisine in a given place at a given time. These books are fragments of our foodways. If I were making a time capsule, I would include a community cookbook. It would tell the person who opened the time capsule so much about the people who buried it. What recipes were worth including in the book? What group of people does the volume’s creation tell us about and what background do they share? What does it tell us about the foodways of the group that published it? If the book is laid out according to courses, as many are, it tells us a lot about the way food was served. How much fat/spice/sugar do recipes have? It tells about eating habits and dietary preferences. There’s a lot of information scrunched between the covers of a community cookbook. Sometimes I pull out volumes from a single geographical region and arrange them in time order and discover what has happened over time to a given place. Sometimes I pull out the volumes published in a five year period and arrange them geographically. Sometimes I pull out the volumes shared by sports teams and sometimes primary schools. Each time I do this, I learn more about the culture and history that underpin our food. I also learn about people. Edited and professional cookbooks have a different focus. They share just as much wonderful information, but they share it differently. Even the ones that are published to represent a group or who are from a food writer who is lovingly detailing the family’s past read differently to most community cookbooks. Professionalism changes the context of a cookbook and that book tells us a different story because of it. Sometimes I think that the community books are like seventeenth century chapbooks. I still love seventeenth century chapbooks and my volumes of reprints are fewer, too, because of that theft, but this isn’t the parallel I’m making today. Nor is the obvious one: that both are printed ephemera. The audience is the interesting bit for me. Chapbooks have a different audience to bigger volumes because they wee cheap and more disposable. They also have a different audience because they were often brought into lives by peddlers and on streets rather than being the stuff of up-market bookshops. The peddler and the community stall at a fete have overlapping social roles. The other book that has something important in common with the community cookbooks is the handwritten record of family histories. They linked to the other end of the market, during their earlier days, because literacy was not even close to universal when individuals started writing down their family recipes. Household notes, or detailed recipes - some families kept them. They cover some of the same functions as the community cookbook, preserving local foodways. What they share is that need to define what’s valuable to the family, to the community. Many of the recipes In the bushfire cookbook are nothing like those in some of the community cookbooks lost in the fires. Most of those parts of rural Victoria had very Anglo cuisines in its community books for many years. Recipes for dishes such as scones were consistent across space and even time in that region. Homemade, the bushfire book, has three scone recipes, and none of them are for plain scones. One is for ham and cheese (in pinwheels) and the others are lemonade scones and pumpkin scones. Scones are still a recipe that helps heal, but the type of scone has changed just as the culture of the community has changed over time. That’s why I love these cookbooks so very much. I can read the foodways over time and those foodways are magic. My gran saved up flour bags and sent them off to get 5 copies of homeprides baking book from the 1930s (I think) one for each of her children, though due to the time and society the sons' book were given to their wives on marriage! the daughter also got theirs on marriage but my mum got hers early (by years) as she stayed home to support my gran until her late 30's but the book came to our home and is now in my house! 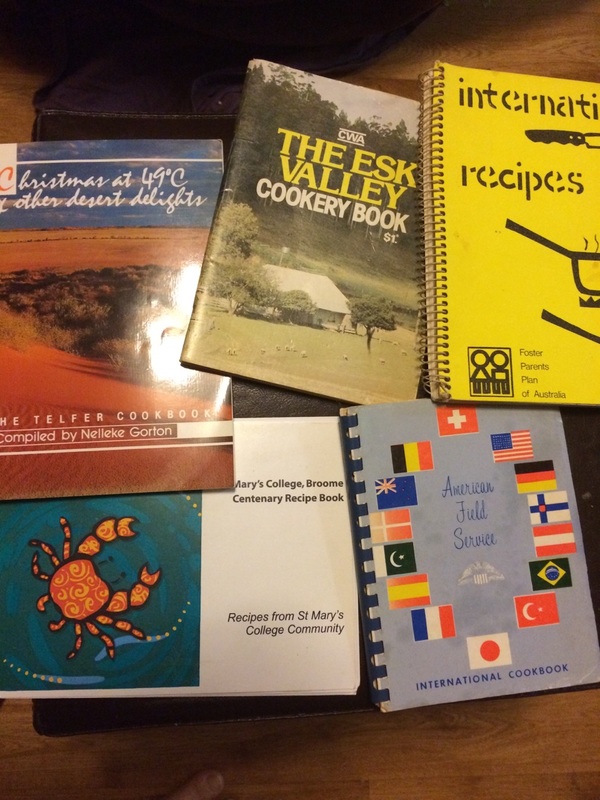 I have a dairy cookbook with microwave instructions too form the 80's and bought copies for each of my kids to take when they leave home (so far only one has left but I live in hope) both my mums book and mine were done as extras more to advertise than to assist but both are of great use. Sorry, you lost some of your collection, the books I have collected feel like children and I would hate to lose any. What sort of crazy burglar would steal books? Especially cookbooks? Where would you sell that kind of stuff? I’ll keep an eye out for community cookbooks for you. I may even have two or three lying around which I have never used, but bought because it was for a school. I even have a calendar from my own school, with recipes made by our Year 12 students. I can’t give you that, but perhaps you’d like a photocopy next time we meet? My mother is a Holocaust survivor, who was too young to know much about cooking when she went to the camps. She ended up learning to cook on her own and getting recipes from neighbours, including a wonderful old lady from Vienna, who shared a recipe for ice torte, which I have typed up for my own collection. Her own “cookbook” is a jar of recipes cut out of magazines over the years. It might be interesting to look through it for the history. I have a copy of Alice B Toklas’s cookbook, and that is certainly a lesson in what people used in those days. So much fat! Cream! Sugar! Things anyone who wanted to keep their arteries clear would never use in cooking these days! I am also surprised that a burglar stole cookbooks. Was it a targeted theft? I can understand your loss, and do hope you manage to replace many of them. We had no community cookbook, but my mother got a free cookbook from Stork, which served us well throughout my childhood, and I would not like to lose it. I suspect these free sponsored cookbooks, like the Homepride one mentioned above, also had some influence on diet, especially in working class families where it may have been the only cookbook.